Petit Bourgeois | The personal web site of Raphaël Mazoyer: web building commentary and other digital marketing shenanigans. Wrapped up a year and a half of hard work today, handing over the final stages of the launch of our Taiwan business to a new colleague, and engineering to my friends at Dirox and another new colleague who will start on Tuesday. What’s next, again? After two weeks of holiday, a very exciting new step. More details next year! We’ve struggled for years with our implementation of the LG U+ payment gateway on the Évasion mobile site. It relied on a popup window to process credit cards. The Facebook iOS in-app browser does support them, unlike some other apps like Kakaotalk that have disabled popups altogether in their in-app Safari. However, LG U+ does not support that particular setup, and an ugly JS error alert would throw a non-UTF8, illegible message. This last option is less fiddly, and supports the Facebook in-app iOS browser without any complaint. This makes sure that our ads on Facebook do not need an additional layer of email marketing or Criteo retargeting to actually result in purchases. 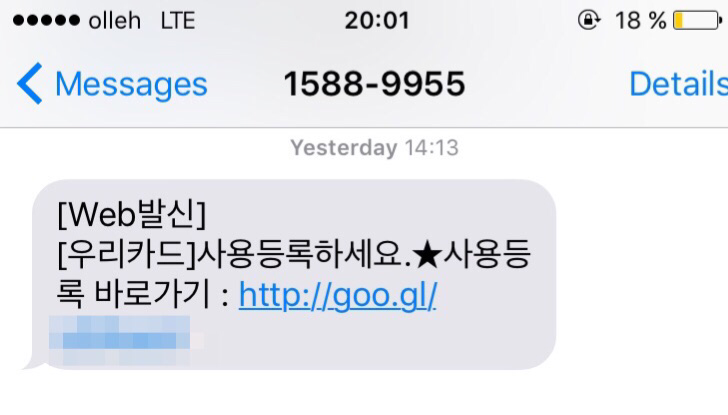 How ironic: my bank, Woori, one of the oldest in Korea and not the most progressive business ever, is using the Google URL shortener when sending out SMS reminders to activate my new cash card. In a country where Google maps is only partly functional, and where Google search brings Évasion only about 7% of our organic traffic (to Naver’s 80+%), I am impressed. This implies some server-side integration, and the willingness to let some customer information transit through Google infrastructure. Looking for a bank with which I can do business in English, on a Mac, and on my iPhone, preferably without installing any plugins or “security” software. 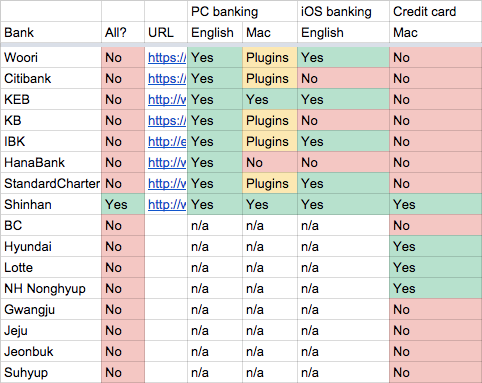 Shinhan’s Mac banking is a downloadable piece of unsigned software that requires overriding MacOS’s security, and only their iOS app “Mini” is available in English. This morning I opened an account at Woori which was a very simple process (it lasted a small hour tho, but only required my alien card, my employment contract, and my passport), and I walked out of the bank with a passbook and a Cirrus cash card, and was able to set up an iOS banking account right away. Might go try KEB instead, and get a card from Lotte. It will not do, then, simply to feel disgust. Everyone is prone to forgetfulness, even under the most favorable conditions, and in a place like this, with so much actually disappearing from the physical world, you can imagine how many things are forgotten all the time. In the end, the problem is not so much that people forget, but that they do not always forget the same thing. What still exists as a memory for one person can be irretrievably lost for another, and this creates difficulties, insuperable barriers against understanding. How can you talk to someone about airplanes, for example, if that person doesn’t know what an airplane is? It is a slow but ineluctable process of erasure. Words tend to last a bit longer than things, but eventually they fade too, along with the pictures they once evoked. Entire categories of objects disappear—flowerpots, for example, or cigarette filters, or rubber bands—and for a time you will be able to recognize those words, even if you cannot recall what they mean. But then, little by little, the words become only sounds, a random collection of glottals and fricatives, a storm of whirling phonemes, and finally the whole thing just collapses into gibberish. The word “flowerpot” will make no more sense to you than the word “splandigo.” Your mind will hear it, but it will register as something incomprehensible, a word from a language you cannot speak. As more and more of these foreign-sounding words crop up around you, conversations become rather strenuous. In effect, each person is speaking his own private language, and as the instances of shared understanding diminish, it becomes increasingly difficult to communicate with anyone. A great example of digital thinking applied to real businesses in this story about the new CEO of struggling UK wine shop Majestic Wines. They are reconsidering some of its commercial practices, such as their six-bottle minimum purchase, some staffing policies, such as the near-automatic reduction in staff when store managers quit, alongside improvements to their IT infrastructure. This strategy is heavy on technology, with planned investments in e-commerce, CRM, and tools that will allow shop staff to better interact with visitors. This probably won’t come as a surprise: the new CEO is founder of online retailer Naked Wines, acquired in April by Majestic. On March 3, 2015, the Lacoste Japan web shop re-launched, based on a shop-plus-brand design supplied by the French headquarters and adapted to the local market, with a dedicated smartphone experience, the local loyalty program, and various online-to-offline shipping options. The original design was provided by NuRun (ex-Cythère, where I used to work in 1997…, and now in the process of rebranding to Razorfish) and coded by iTelios, a French SI house that does a lot of Demandware implementations. At The Plant, our team developed the visual execution in Japanese (typography is always a bit of a challenge), implemented a few tweaks requested by our local client, developed additional content management components to support the new editorial pages, and integrated all of this on our existing e-commerce platform. We’ve been lucky to experience reasonably good commercial performance and almost no technical difficulties, and have also been able to release further improvements at a brisk pace starting days after the launch. Aside from improving the visual aspect of the Japanese web site, and bringing it in line with other countries, this project gives us a great platform for interesting further work. In particular, we’ve got a performance-driven optimization program in place, and several cool CRM initiatives. Last week, I pitched our service Qortex at the Slush Asia event. Here’s the video. As always, it’s pretty embarrassing to listen to yourself speak in public (do I really sound like this?! ), but this was actually fun to do, and I wonder if I’ll have the guts to do such a presentation in Japanese sometime soon, as Xiaomi CEO Lei Jun did last week. After 6 years looking after the digital activities of Japanese sportswear brand ASICS (first in Europe, and since 2011 at global headquarters), I found it was now time for me to explore new activities. But before I’m fully ready to move on, I’d like to take a quick look back. I am immensely proud of my team’s laser focus on runners, and in particular of the MY ASICS running training plans service, but also of the various communication initiatives that are rooted in how people actually practice their sport and engage with it when hanging out online. Launching e-commerce was a painful experience, and the resulting sites aren’t quite what I originally had in mind, but they’re nonetheless a major step forward in digitalizing the company and its relationship with consumers. On a personal side, I’ll miss the daily interactions with the awesome people at Shibuya office, and the sometimes tough but always nourishing guidance of peers and managers. The past 6 years were a blast, and I am thankful to consumers, colleagues and partners for teaching me so much. In particular, I’d like to bow deeply to the runners on the Get Satisfaction support forum for MY ASICS. They’ve stuck with us through the launch of the new platform early 2011, and provided valuable feedback at every turn. And every once in a while, there’s a heart-warming story that makes it all worth it. It’s been over a month I’ve left the office, and I’ve already been working with friends and acquaintances on various projects. (One of them was a fairly successful political campaign which couldn’t quite conceal very poor national results.) I’ve also been in talks with several companies in Europe, Japan and the US to join their operations but nothing has yet resolved itself in a binding contract for full-time employment.